Often in life, all we get are hazy glimpses into the existence of other species that share the world with us. Yet sometimes, we are given the chance to see more, to see beyond those incidental encounters. Last night we had dinner out with Koy, the Thai graduate student who recently arrived here in the US to study local fireflies. She brought her roommate, Jeab, who came from Thailand with her and is studying English here. I am very glad that we have this opportunity to meet and work together. She told us of her home by a river near Bangkok. At her house she has created a firefly garden with a net over it. I can only imagine this ~ how beautiful an idea. The firefly field study has begun, but it is not going well. Last night Koy said, ‘I found more mosquitoes than fireflies.' The population is dwindling. I am hoping there will be more soon, but that may not happen. The soil is so dry here it is dust. But even so, Koy and I finally found a female firefly (they are wingless) and watched her mate and then go back into her burrow in the soil where she will lay her eggs. Koy wanted to bring water to soak the soil around the burrow so the larvae can survive when they hatch. But if predictions are correct, the sky will bring rain for all the creatures. There were few fireflies, but the evening was not a total loss. We found a big predator female that attracted a male of our study species and made a meal of him. It was the first time Koy had seen this. This type of predation is not found in Thai fireflies, and helps to explain why there are so few of ours! We will not go back for a week or so. Yesterday evening, the moon was full and shining on the lake. Koy and her friend Jeab and I collected data. My part involved standing still and counting male fireflies that were attracted by an artificial female (a device that flashes like the signals of real females). The mosquitoes were ferocious! I think we are getting good data now (finally! 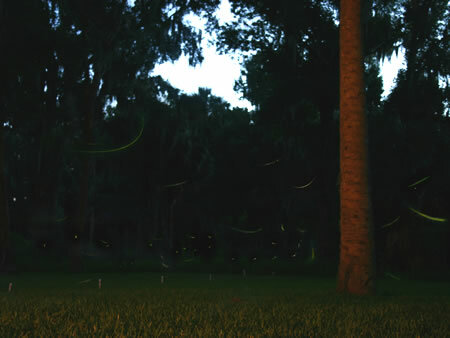 ), but it is questionable whether we will get enough before the fireflies are gone. I do hope so. Another evening chasing fireflies. There were storm clouds on all sides as the sun faded out behind the cloud bank, and lightening touched the clouds again and again. ‘Just give us 20 minutes before you close in and begin to storm,' I asked the storm clouds. A little rain fell, and the storms drew closer. But the moon appeared briefly between the clouds, reflecting on the water. We did finish for the night and were back in the car when the sky opened. The cycles of season, the cycles of sun and rain, the cycles of life, the cycles of interaction, they are turning, if only we will notice. Like the flower feeding the bee and the bee pollinating the flower. And fireflies are like this too, showing us the cycles, with mating and egg laying and the death of adults corresponding with the time of emergence of larvae. It is too easy to get closed into a corridor of sequential events and lose track of the cycles. Koy brought along two Thai student friends to help collect data, and it was a pleasure meeting them. I am still amazed by these people being able to come here and overcome all the obstacles to study at the university in a different language. And they were talking about cultural differences, which was interesting. Like in Thai culture, it is normal to notice that someone might need help and ask if they do and offer help. But they do not ask for help. And here they found the opposite; they get no help unless they ask. Nobody notices and offers. And another thing, in class discussions, western students argue aggressively, interrupting often, but Thai students would typically wait for a silence before speaking. And so might never be heard here. It was a good firefly night and good for conversation driving to and from the study site. I asked Koy to practice some words that are difficult for her to pronounce, like 'shrimp.' She thought it very funny that I did this. When Koy and Jeab speak Thai with one another, I love the sounds and rhythms of the language. But no, I cannot speak a word of it. I cannot even say ‘shrimp.' This study will probably be over within a month because the fireflies will be gone, but she is working on many things. I believe she will be here until December. I would like for her and her friend to see snow before they leave, though it will be at least a day's drive to get where it might be. When we arrived at the study site, where it had already rained, we could hear thunder and the sky flashed bright with lightening repeatedly as we were setting up. The darkness came early, so the fireflies started flashing early. We had a few minutes of good data collection, but then rain started, not heavy. And all the fireflies were gone! It was so dark. We stayed a little longer to finish the schedule of repetitions, then hurried to load the car. On the way back, there was heavy rain, so heavy it was dangerous driving and in places the sides of the streets were flooded. I was glad to get them home safely. Rain was falling when I went to pick up Koy, it rained all the way over to pick up her friends, and it rained all the way to the study site. But at the study site it was not raining. It may have been the only place rain was not falling. We collected our data and then drove back, and yes, it was raining! It was a beautiful evening with the insects last night. The setting sun and some spectacular cloud formations combined for beautiful, fleeting colours. But it was windy, as if rain were impending, but it didn't arrive. It was so windy the male fireflies couldn't control their flight path, and in fact, so windy there were almost no mosquitoes. It is never the same twice, so it seems. At the study site there were clouds filled with sun hues. It was not a great night for data, and we are wondering how long the population will last, as it seems to be dwindling again. Koy needs a minimum of two more weeks. Last night was amazing. The night before was discouraging, with the population of fireflies seeming to decline. And last night, it would have been easy to cancel, with rain falling when I left to pick up Koy, raining the whole time we went to pick up her friends, and it was still raining at the site. So we set up and worked in the rain. And it was a magical night. So many males, with their beautiful lights in the gloom. So much data. And one of the Thais lent me a book on Buddhism, which is dense reading. I confess, I do not really understand how one can live without desiring and clinging. But I like this summary of daily practice: Do good, avoid evil, purify the mind. There might me a lot in that part about purify the mind, though! The field work ended on a positive note. Last night the population was good and we finished the data collecting. I am a bit sad that it is over. The fireflies don't care whether we are there or not, of course. Now the car is empty, no scientific study gear. Koy will be busy analyzing data and writing. I slept like I needed some extra rest, to help me begin again, now that this page has been turned.